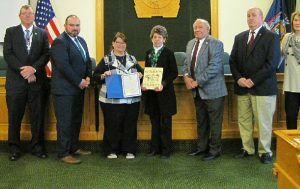 OSWEGO – The Oswego County Legislature’s Economic Development and Planning Committee presented a proclamation designating Agriculture Literacy Week to Cornell Cooperative Extension of Oswego County. Thanks to technological, marketing and scientific innovations, modern-day agriculture is a mystery to many people, making the need for agricultural literacy more crucial than ever. Across the state, second-grade students gained a better understanding of how food goes from the farm to their table as volunteers brought agriculture-themed books and hands-on lessons into their classroom March 18 to 22 in celebration of Agriculture Literacy Week. Pictured from left are Paul House, District 8; Terry Wilbur, District 21; Committee Vice Chairwoman Mary E. Chesbro, District 10; Oswego County 4-H Program Educator Debbie Holliday; Morris Sorbello, District 23; Cornell Cooperative Extension of Oswego County Executive Director Paul A. Forestiere II; and Marie C. Schadt, District 19.